Healthier plants, higher yields, and peace of mind. 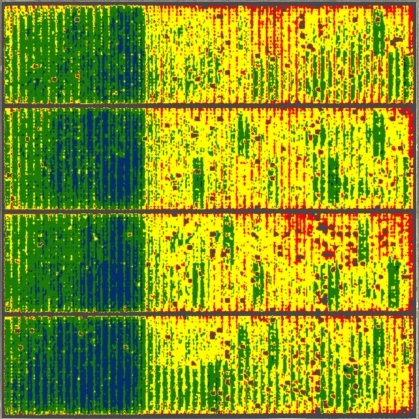 Use aerial spectral imagery to optimize your fields. No upfront cost or hardware to buy, and you pay by the acre. 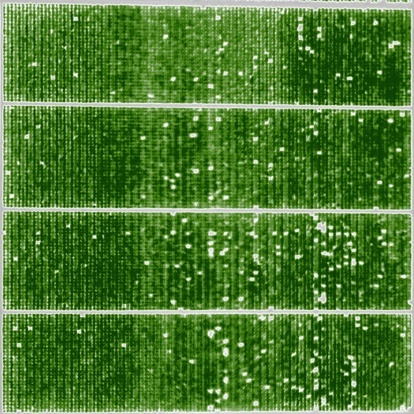 At Ceres Imaging we capture, process, and deliver high-resolution spectral imagery as an agriculture service. We help growers make important resource allocation decisions by showing them real-time plant health throughout the growing season. Identify irrigation system issues and adjust your irrigation strategy in-season. 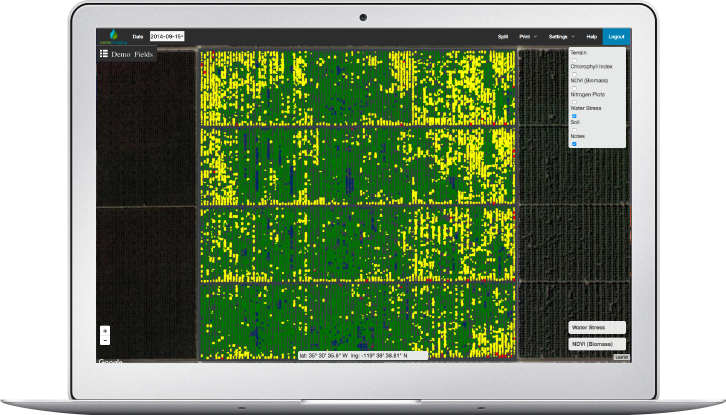 Ceres images can detect pest and disease activity during mid-season stages of growth. Our algorithms show important trends during the critical points of your season as well as year over year and multi-year trends. Identify nutrient deficiencies, establish management zones, and enable variable rate applications. Measure water and nitrogen content at a plant level. Real insights into your land and crops, on demand. Water Stress reveals more detail on plant health than traditional NDVI data, with results backed by university trials and numerous customer case studies.  Our delivery of this widely used benchmark of vegetative vigor is best-in-class. We combine near-infrared and visible spectra into a leaf chlorophyll index, a strong indicator of nitrogen content. Grower spent $3,200 on 160 acres of water stress imagery. Irrigation issues highlighted and addressed led to 25% yield improvement on 40 acres of the field, worth $120K net of capital expenses (or a return on investment of over 30x). 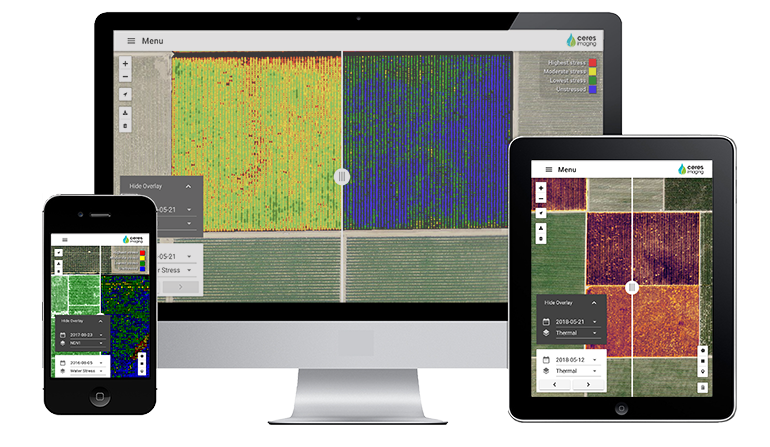 Access high-res imagery in your office, or take it to the field via our mobile app. With offline imagery access and GPS within our mobile app, growers can walk to the exact location of trouble spots or patterns highlighted by our imagery to investigate further and take ground samples. 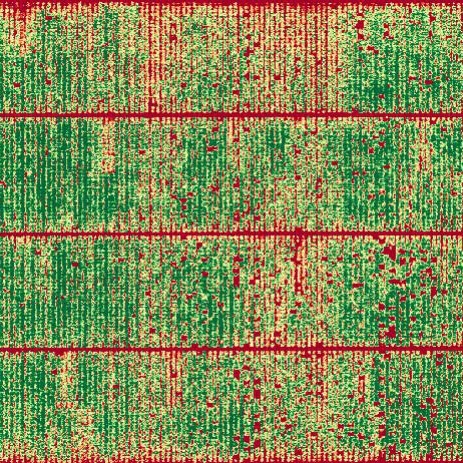 See how growers have used Ceres Imaging and precision farming to save resources and increase land use. See how the ranch used agricultural images for their large field of row crops. See how Ceres helped Century solve problems in their almond orchard with a great ROI. Ceres Imaging helps North Dakota and Minnesota potato growers optimize pivot irrigation systems to improve crop quality. As growers you can see your entire fields so that they can make decisions that have maximum impact. Ceres imaging offers your the benefit of big data. Hundreds of farm managers rely on Ceres Imaging technology every year. Our sales team is available Monday - Friday 9 a.m. - 5 p.m. PST. Copyright © 2019 Ceres Imaging, Inc. All Rights Reserved.